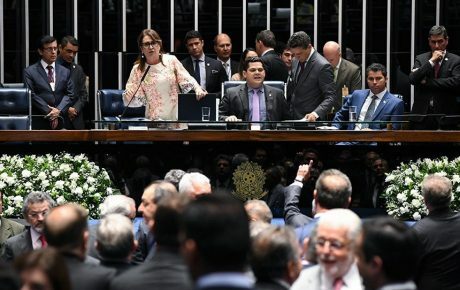 In one of the most turbulent sessions Brazil’s Senate has ever seen, the chamber has finally elected a new president. Senator Davi Alcolumbre, of the right-wing Democratas party, gathered 42 out of 81 votes, despite running practically unopposed after a series of twists and turns which disgraced the upper house of Congress. Veteran Senator Renan Calheiros, one of the most powerful powerbrokers in Brazilian politics, removed his candidacy at the last minute and will move to the opposition, which could spell trouble for the Bolsonaro government. 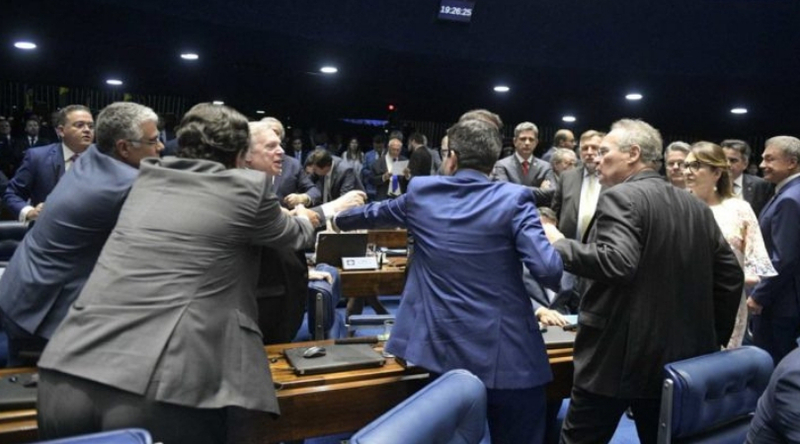 Unlike the lower House of Representatives, which re-elected Rodrigo Maia with no fanfare, yesterday’s voting session in the Senate was unbridled chaos. After over four hours of political maneuvers, loopholes, jeers, insults—and a bit of petty theft thrown in for good measure—the election for Senate President was postponed until Saturday lunchtime. Saturday’s session was no less eventful. The first attempt at an election was annulled after the governing board counted 82 filled ballots in a chamber of 81 Senators. While the second vote was in progress, favorite Renan Calheiros took the stand and announced the withdrawal of his candidacy, declaring Davi Alcolumbre the new president. The madness of Friday’s session revolved around the matter of the voting system to be used in the election. According to Senate protocol, presidents of the chamber are chosen by a secret ballot, with whoever receives a majority of votes being elected Senate President for a two-year term. With the increased public clamor for anti-corruption and accountability of elected officials, there were calls (in both houses of Congress) for elections to be held in open, nominal ballots. 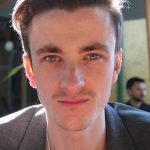 While this idea may well have been taken as a sincere ideological stance by some politicians, the main target of the push for an open ballot was the frontrunning candidate, Renan Calheiros. A skilled horse trader and corridor negotiator par excellence, Mr. Calheiros was confident of winning in a secret ballot, where party lines can be disrespected at will without fear of retribution. However, Congress specialists reckoned he would have trouble getting elected in an open ballot, as Senators don’t want to be seen voting for Renan Calheiros. While imperiously influential behind the scenes, Mr. Calheiros is targeted by 13 inquiries related to Operation Car Wash, Brazil’s mammoth investigation into corruption in politics and the private sector. The archetype of the country’s “old politics”, supporting Mr. Calheiros could be seen as a betrayal by the voters of the slew of Senators elected on anti-corruption tickets. Therefore, Renan Calheiros’ opponents had only one choice: they had to push through an open vote. And they very nearly managed it. Among this anti-Calheiros cadre was Onyx Lorenzoni, President Jair Bolsonaro’s Chief of Staff. Though the government stated it would not interfere in the elections for either the lower house or Senate, Mr. Lorenzoni actively backed the candidacy of his party colleague and eventual winner, Davi Alcolumbre. Elected Senator in 2014 for the right-wing Democratas party, Davi Alcolumbre spent four years in the shadows, rarely seeking the political spotlight. His relatively low profile and young age (41) served as an advantage for his candidacy, and being a member of the so-called Bullet Caucus—a parliamentary front which advocates for tough public security legislation—Mr. Alcolumbre was tipped as an ideal candidate for the government to get behind. Onyx Lorenzoni’s plan was to get Mr. Alcolumbre to preside over the voting session on Friday, and use this position to push through the measure for an open ballot. Being the only remaining member of the previous Senate governing board (barely, as he was the third substitute for secretary), Mr. Alcolumbre was technically eligible for the role. However, the fact he was a candidate for the presidency was an obvious conflict of interest. As expected after such controversy and confusion, the matter of the election and the open ballot was sent to the Supreme Court. 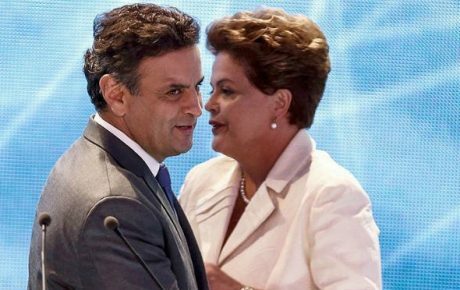 Allies of Renan Calheiros sent an appeal to the country’s highest tribunal, demanding the election take place in a secret ballot. Chief Justice Dias Toffoli, on call for the weekend, accepted the request at 4 am on Saturday. In the extraordinary and decisive session on Saturday, the Senate was presided over by José Maranhão, the oldest member of the chamber. After four hours of platitudinal speeches, the once exhaustive list of candidates was cut down to a handful, with many competitors withdrawing their bids to support Davi Alcolumbre, seen as the only one capable of overcoming senatorial giant Renan Calheiros. It appeared that the vote would finally take place in peace, until the number of ballots were counted up. While there are only 81 Senators, 82 paper ballots were tallied up. Eighty votes were correctly submitted, enclosed in envelopes and deposited in the ballot box. However, two extra papers were found, without envelopes. The ballots were shredded and a second vote called. Presumably having been informed that his chances of victory were low, Renan Calheiros took the microphone and declared his withdrawal from the race. Despite pleas for the election to be annulled for a second time, the Senators continued submitting their votes. Mr. Calheiros, in protest, refused to fill out his ballot. Davi Alcolumbre won a total of 42 votes, just surpassing the 41 necessary to have an overall majority. Having orchestrated the candidacy of Davi Alcolumbre, the election of Renan Calheiros would have automatically spelled defeat for Chief of Staff Onyx Lorenzoni, the government’s official liaison with Congress. However, the way in which events played out, and the way in which Mr. Calheiros was defeated, may yet cause serious problems to the administration. The Senate will now begin the year riled up, engaged in conflict against itself. The result of the election may even be the subject of further appeals to the Supreme Court. Crucially, during wartime, no work gets done. Instead of voting on bills, Senators will use the coming weeks and months to settle scores, delay proposals, and block votes. Most important of all, the government must pray it hasn’t made an enemy out of Renan Calheiros. During his final speech before Saturday’s election, Renan Calheiros launched a direct attack on the office of the President’s Chief of Staff. 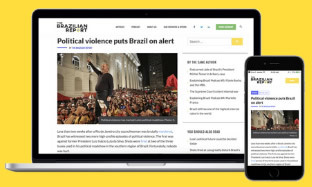 While declaring the withdrawal of his candidacy, he criticized Senator Flávio Bolsonaro, the eldest son of the president. Entering his fourth eight-year term as a Senator and having failed in his push for a third stint as president of the chamber, Renan Calheiros remains among the most powerful political powerbrokers in post-dictatorship Brazilian politics. A cursory glance through recent Brazilian history sees Mr. Calheiros pop up everywhere, always close to the source of power, like a mix between Forrest Gump and the Highlander in Brazil’s legislature. A useful hack for beginners wanting to understand politics in Brasilia is to always pay attention to the movements of Renan Calheiros. Like a moth, he is constantly chasing the glow of political power and influence. Now, one of the most powerful corridor negotiators will form part of the opposition. And as Jair Bolsonaro’s administration may be about to find out, hell hath no fury like Renan Calheiros scorned.